QUEEN’S PARK — The Liberals’ sunny climate change report released today disguises some major problems, even as the climate change clock is ticking. Sure, Doug Ford would be a disaster for the climate and Ontario’s opportunity to create low-carbon 21st century jobs, but that doesn’t mean Ontarians should give Kathleen Wynne a free ride. The Liberals have trotted out a basket of programs funded by cap-and-trade revenues. Yes, electric vehicle rebates and smart thermostats are important, but they won’t be enough to meet the province’s own targets. And if you look deeper, you’ll find endless government policies that contradict and undermine our greenhouse gas reduction goals. Canadians are already paying the costs of extreme weather caused by climate change – $4.9 billion in insurable losses in 2016 alone. But for all their talk, the Liberals always seem to side with their friends in industry. The Green Party’s climate plan would end the loopholes for large emitters, ban fracking, and activate a new green workforce. Rather than selling off public assets and pouring billions into expensive and dangerous nuclear power, we would bring our energy system into the 21st century with smart ideas that protect the environment, save money, and create jobs. “We need strong voices to take the Liberals to task when they choose polluters over people. 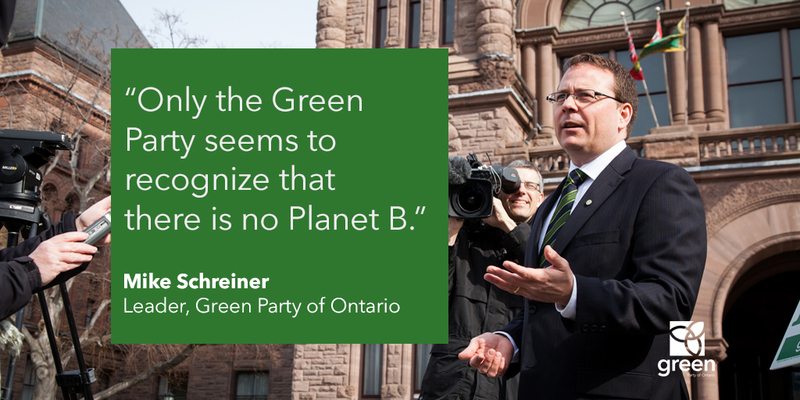 The Green Party has a real climate action plan that does not tinker on the margins or have the fingerprints of industry all over it,” said Schreiner. QUEEN’S PARK — The Ontario Progressive Conservative Party leadership fiasco is a stark reminder of the sad state of politics at Queen’s Park. The election of Doug Ford as PC leader is a sad reminder of how far we still have to go find honest solutions to the climate crisis and rising levels of inequality. This is not a time for, as defeated candidate Caroline Mulroney mentioned, policy on the back of a napkin. “The entire PC leadership fiasco has shown Ontario that this version of the PC party is not ready for prime time. 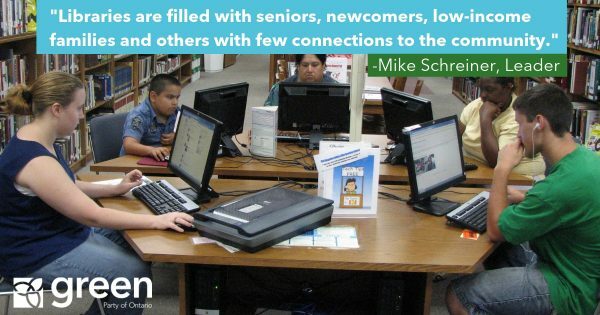 We need honest solutions that work for people, not anger and divisiveness,” said Schreiner. 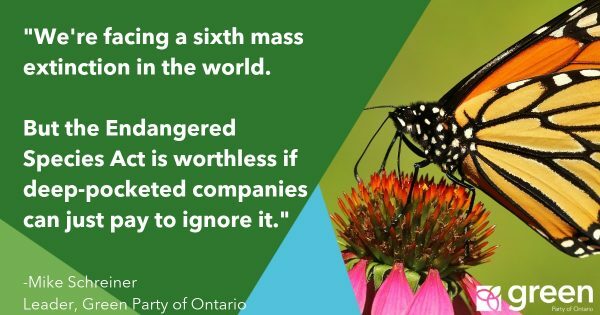 “The united front that all PC candidates showed against market solutions to the climate crisis is a sure sign that the party is not ready to govern and is clearly out of touch with the majority of Ontarians. 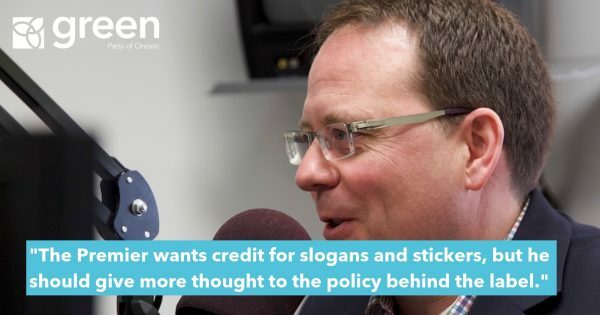 Ford’s rhetoric about carbon pricing being a job-killer is false and dishonest politicking,” added Schreiner. The Green Party does politics differently. Mike Schreiner is on a mission to bring honesty, integrity and policies that put people first to Queens Park. 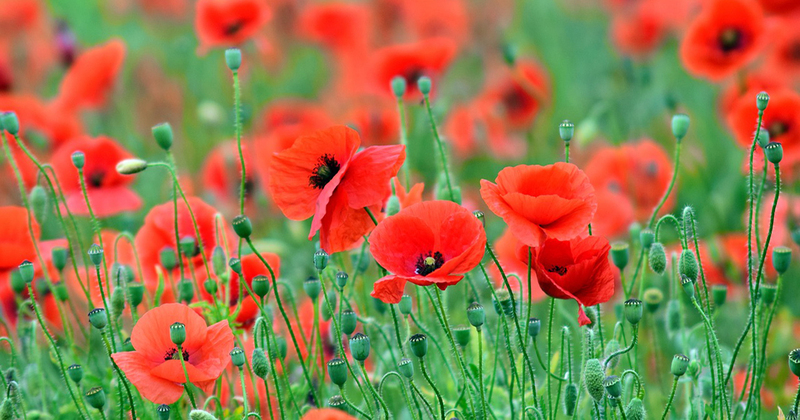 It’s sorely needed now more than ever. “The Liberals have been conned into selling an asset that paid Ontario dividends each and every year,” says Mike Schreiner, Leader of the Ontario Green Party. According to the Financial Accountability Officer of Ontario, the partial sale of Hydro One will cost the Ontario government 1.8 billion dollars in cash flow over time. The sell-off of Hydro One was a Liberal mistake that we will all pay for in the end. 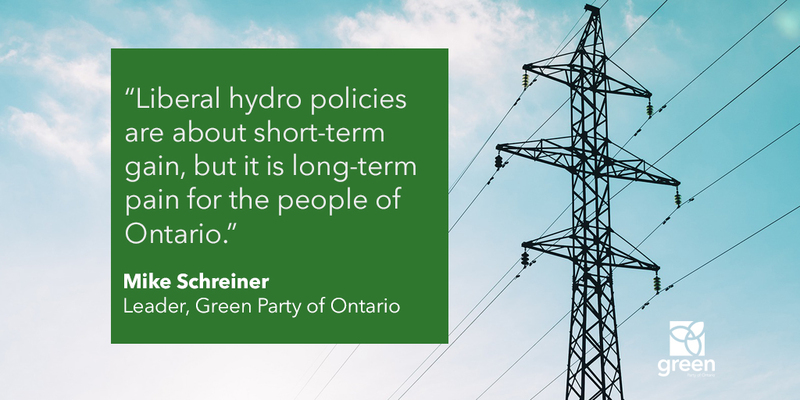 “The people of Ontario built Hydro One over decades into the wealthy transmission and distribution utility it is now, a huge public asset,” according to Schreiner. To compound the problem, the new privatized Hydro One bought U.S. Avista last year, which has a stake in coal: the dirtiest power generator available. The big-three-status-quo parties continue to be dishonest about where we get our power from and how we really pay for it. The purchase of Avista last year undermines the Liberals’ stated goal of reducing greenhouse gas emissions (GHGs). The Fall Economic Statement fails to deliver real solutions for small businesses and real help for people in need. TORONTO – Green Party of Ontario Leader Mike Schreiner says the Liberal government’s corporate tax cut isn’t enough to help small businesses cope with the rapidly rising cost of paying workers a living wage, and will do nothing to help them grow and create jobs. The GPO plan to raise the exemption level for the Employer Health Tax from $450,000 to $1,000,000 in payroll would automatically and immediately benefit small businesses and non-profits to lower their labour costs. They wouldn’t have to fill out paperwork to apply or wait until they file their taxes. The GPO plan would not create a disincentive for small businesses to grow. It would create an incentive for them to create more jobs that pay better. The GPO supports the planned increases in the minimum wage, but would also like to see increases in social assistance rates to help the most vulnerable in Ontario. Real People, Real Solutions is a series of interviews with people who are making a difference in communities across Ontario. Hosted by GPO leader Mike Schreiner. In this episode, Mike talks to Peter Ormond, a community leader in terms of helping people save energy about how they can make small changes in their own homes and businesses to really engage in the Green economy, enabling them to save money while saving the planet at the same time. In this episode, Mike talks to Peter Ormond, a community leader in terms of helping people save energy about how they can make small changes in their own homes and businesses to really engage in the Green economy, enabling them to save money while saving the planet at the same time. eco5 is the acronym for Environmentally Conscious Organization, and the “5” represents the 5 R’s of Reduce, Reuse, Recycle, Rethink and Revitalize. Peter has engineering degrees and an MBA that helps him recognize the glaring disconnect between our formal educational / theoretical world and the practical solutions that will benefit the Earth. He has run in several elections as a Green Party candidate and attended several United Nations Climate Change Conferences. Green Party of Ontario Leader Mike Schreiner is urging the Liberal government to offer real help to small businesses in Tuesday’s fall economic statement by lowering payroll taxes on employees. “The most efficient and effective way to help small businesses to create more jobs is to raise the exemption level for the Employer Health Tax, which has increased only slightly since the late 1990s,” said Schreiner. Businesses with payroll of less than $5 million would not be charged the EHT on the first $1,000,000 of payroll, helping them save up to $20,000 a year and injecting over $800 million into local economies. The governing Liberals do little to help small businesses, preferring instead to hand out billions of dollars to huge corporations and to cut taxes for Bay Street instead of Main Street. “The Liberals focus on big corporations and mostly ignore the real job creators — small businesses whose individual job numbers add up to millions of good jobs,” said Schreiner. The Greens’ tax cut plan would also help small businesses adjust to a rapidly rising minimum wage. “The GPO is the only party with a balanced plan to support small businesses and living wages for workers,” said Schreiner, who is also the Green Party candidate in Guelph in next June’s election. Schreiner said the small business entrepreneurs who are essential to building diversified, resilient local economies that generate sustainable jobs and prosperity are not being properly supported by the Ontario government. The GPO is on a mission to bring honesty, integrity and policies that work for people to Queen’s Park. 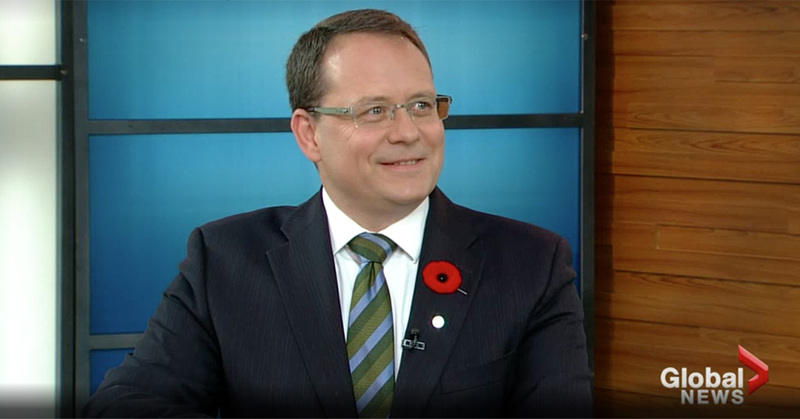 Watch Mike Schreiner on Focus Ontario as he talks about the provincial long-term energy plan, marijuana legalization and why it’s time to elect a Green MPP in Ontario. Skip to 10:19 to watch the start of the interview. “Thank you to Norm Miller for taking the initiative with Bill 173 to support fully compostable single-use coffee pods. Keeping the millions of pods used annually out of garbage dumps helps the environment and our economy. Ontario entrepreneurs already have the creativity to come up with various compostable options. Passing Bill 173 will help support this creativity, promoting a sustainable business model and reducing trash that affects the bottom line of every municipality. The Green Party has long called for a zero waste strategy, involving businesses and consumers in creating a system for sustainable waste management. Thanks to MPP Miller for taking this step in addressing a growing waste problem. We just wish it had a faster implementation than four years – we support taking urgent action.